Tag Archive | "Mystery Snails – (Pomacea Diffusa)"
Mystery Snails (Pomacea Diffusa) are a common freshwater snail found in the Amazon River system throughout Bolivia, Brazil, Paraguay and Peru . Depending on their size and shell colors, they are also known to tropical fish keeping enthusiasts as the Spike Topped Apple Snail, Golden Mystery Snail, Apple Snail, Golden Apple Snail, Ivory Snail, etc. Mystery Snails (Pomacea Diffusa) are one of the 120 species that belong to the Ampullariidae family that are frequently called Apple Snails (Pomacea bridgesii) which over time were named “Mystery Snails” by pet shop owners. Mystery Snails are NOT Apple Snails. 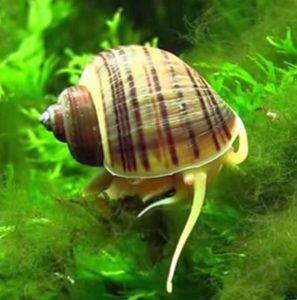 The Mystery Snail (Pomacea Diffusa) is the snail that is most commonly sold in tropical fish shops. Apple Snails (Pomacea bridgesii), based on mitochondrial DNA analysis, were found to be a distinct, rather rare species that is known to inhabit the Rio Grande, Reyes River at Beni. Apple Snails are considered an invasive species in the United States and although they do resemble Mystery Snails in appearance, they grow much larger (apple sized) than Mystery Snails (golfball sized). 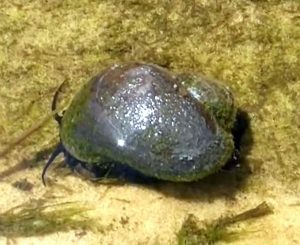 Mystery snails are among the largest freshwater snails and depending on the species, can grow to over 2 inches in diameter. Many Mystery Snails grow to only 1 or 1 1/2 inches in diameter. 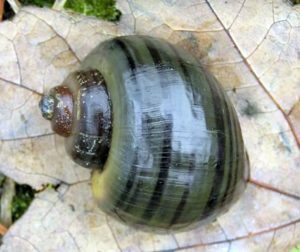 The head and body of a Mystery Snail (Pomacea Diffusa) is generally a dark grey or black color with a foot that is a lighter gray, however Mystery Snail body colors can range from yellow, gold, blue, green, brown and even purple. The head and body of a Mystery Snail is spotted with orange dots. The top part of the mouth, the siphon and the tentacles are slightly orange in color with dark to black lateral dashes on the siphon. Orange rings appear around the eyes where they rest on the tip of the eye stalks. The shells of Mystery Snails are colored Golden, Black, Blue, Green, Purple, Ivory White, and various shades of Brown. Their shells can be a solid color, have a color gradient, or have accents of light brown, dark brown, black stripes, and other markings. The combinations are limitless. Albino specimens have a white body with a striped brown shell. What sets these snails apart from other species of snails is their unique breathing apparatus and breeding techniques. They can breathe through their gills as well as through a siphon that extends from the front of their body. The siphon is typically longer than the body of the snail, and allows the snail to breathe while submerged. Mystery Snails have an operculum that they use to seal themselves into their shell and allows them to remain out of the water for extended periods. Mystery snails are quite peaceful and can be safely housed with any freshwater fish, shrimp, or plant species. They are mainly used by tropical fish keeping enthusiasts as a colorful means of waste management and algae control in just about any size freshwater aquarium. In their natural habitat they remain hidden in the muck or submerged vegetation during the day, and become more active at night, sometimes venturing out of the water in search of fresh vegetation. 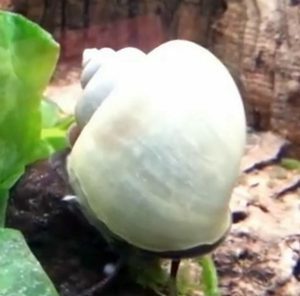 In an aquarium environment, two to four inches of open air space above the waterline in the tank is required, as this snail needs open air to breathe. Although they are extremely adaptable and can be safely housed in planted or community tanks of any size, like other gastropod mollusks, they cannot tolerate copper in even minute amounts. These snails do better in hard water and need a decent amount of calcium in the water to maintain their shell health. In softer water environments, they do well when fed supplements of calcium rich foods. Mystery Snails are easily bred and usually to so without any outside encouragement. Traditional male, female pairing results in cocoon like clutches of light pink, frothy, clumps of eggs that are usually laid at night above the water line on the side of the tank. Depending on temperature, anywhere from 10 to 500 or more eggs will be laid about an inch or so above the surface of the water. If the humidity is high enough, the eggs will generally hatch out in 2 to 4 weeks. The baby snails will fall back into the water and need no additional help to grow. The young are scavengers and eat the same diet as adults. The humidity in the tank can be elevated by placing a tight cover over the tank. If the eggs are in a community aquarium, it is wise to either remove any snail eating predators from the tank or remove the eggs to a “hatching” tank before hatching occurs. Feeding Pomacea Diffusa is not a problem. They will clean the tank from uneaten fish food, fish waste, decaying plant matter, and algae. Their diets in a “clean” aquarium should be supplemented with vegetables, flake food, sinking pellets, bottom feeder tablets, frozen, and live foods. In softer water environments they should be provided calcium rich foods such as spinach, kale, or even a submerged cuttle bone to promote proper shell growth. Mystery Snails are usually readily available in pet stores and online when they are 3/4″ to 1-1/4″ in size.